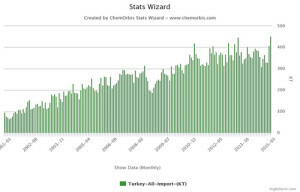 According to ChemOrbis Import Statistics, Turkey’s overall polymer imports hit an all time high on a monthly basis in April. Homo PP and HDPE paved the way for the record imports on a product basis while other products’ contribution to the record was relatively smaller. 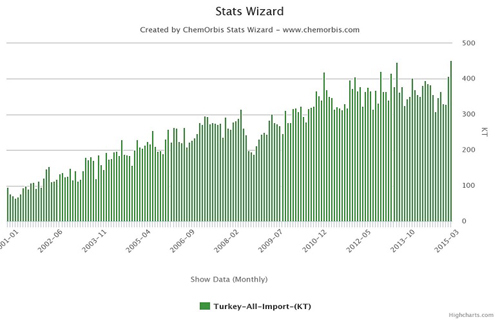 More than 450,000 tons of polymers were imported in April, surpassing the record last broken in July 2013 with more than 445,000 tons of imports, as can be seen from the graph below prepared by ChemOrbis Stats Wizard. There was a severe tightness concern that started in early February in almost all of the markets, which pushed buyers and resellers to actively seek cargoes during February and March. The tightness was so severe that some PP fibre and HDPE film buyers had to shut some of their lines due to lack of material and cancelled orders. Accordingly, the arrival of these cargoes throughout April resulted in record high imports on a monthly basis. On a product basis, more than 150,000 tons of homo PP imports were recorded in April, displaying a record high on a monthly basis. It is also 17% above the nearest record broken in January 2014. HDPE imports were also at an all time high in April with more than 75,000 tons. When compared to a month before, HDPE imports posted a gain of 42%. In comparison to the nearest record hit in May 2013, April imports signify an increase of 17% for HDPE as well. For homo PP, PP copolymers, HDPE , LDPE, LLDPE, PS, PVC, ABS and PET, you can visit ChemOrbis Import Statistics by product and ChemOrbis Import Statistics by country to view exact import figures on a yearly and monthly basis in further detail .